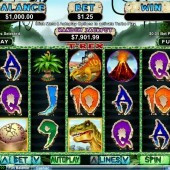 If you've ever played Random Logic's cracking prehistoric-themed slot, Dawn of the Dinosaurs, or the popular dino-dwelling video slot from Aristocrat, simply called Dinosaur, you'll know that the time of the giant lizards has proved pretty successful breeding ground recently for slots developers. 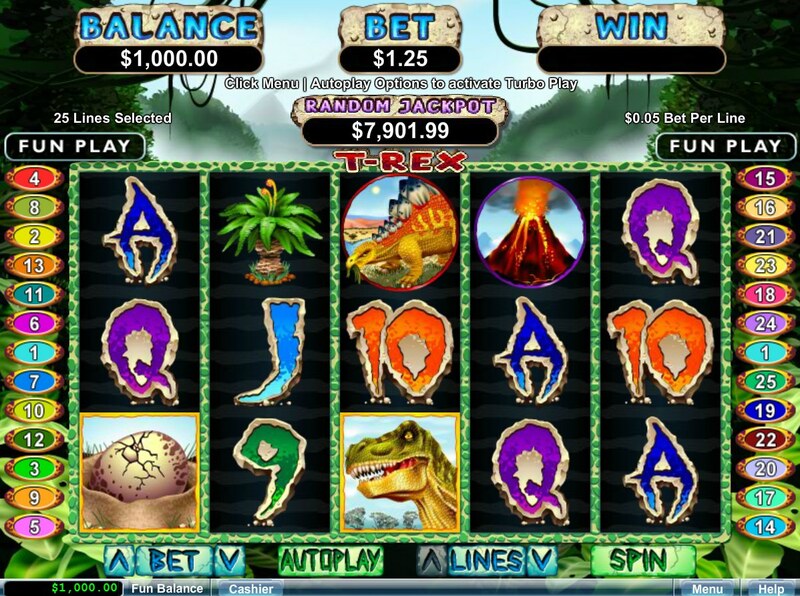 Slot developer RTG don't miss a trick, however, and their addition to the pile, T-Rex, takes the most fearsome predator from the Jurassic Age and drags him - stumpy little arms and all - forward a few million years to star in his very own video slot. T-Rex is a 5 reel, 25 pay-line slot with plenty of authentic images and graphics (here carved into rock, Flintstones-style) of dinos and scenery. There are fiery volcanoes, dino eggs, prehistoric-looking card symbols (presumably taken straight from an early Vegas casino) and a range of dinosaurs, from a Triceratops and an Ankylosaurus to a Stegosaurus. Our fearsome friend acts as the game's Wild, appropriately enough, and he substitutes for all symbols other than the Scatter. It only takes two Wilds to form a winning combo, but get five across the reels and you'll scoop the top jackpot of 10,000 coins. Not only that, the T-Rex doubles the prize from any winning combos he forms. If the Wild seems a bit stingy, the Scatter goes some way to making up for things. Three or more of those across the reels triggers a Pick Me Bonus - or in this case, Pick An Egg - where you pick from a selection of jumbo-sized dinosaur eggs all ready to hatch. Up to 10 free spins can be won this way, but there's more: if our T-Rex pal appears on reel 3 during the freebies he'll gobble up any dinosaurs appearing elsewhere on the reels and replacing them with himself, therefore turning those spots Wild. It's a nice touch to conclude the bonus round. With a progressive jackpot and a Wild that only appears on one reel, this would seem to be a slot for the higher-betting gambler. There's still plenty to enjoy for the low-stakes player, however, with its free spins round, but for lots of low-end wins you might want to stick to other games. I enjoyed the prehistoric theme, but give me Dawn of the Dinosaurs any day of the week.